Gibbons are apes that are highly adapted to arboreal life and are found in tropical and subtropical rainforests in Southeast Asia. Also called the lesser apes, gibbons differ from great apes (chimpanzees, gorillas, and orangutans) in being smaller, with longer arms and dense hair, in not making nests, and in certain anatomical details in which they superficially more closely resemble monkeys than do the great apes. Gibbons are social animals and form pair bonds. Strongly territorial, they defend their boundaries with vigorous visual and vocal displays commonly sung as duets by mated pairs. They are masters of brachiation, swinging from branch to branch for airborne distances of up to 15 meters (50 ft) and achieving speeds as high as 56 km/h (35 mph). They can also walk bipedally with their arms raised for balance. One unique aspect of gibbon physiology is the ball and socket joint forming the wrist connecting the hand with the forearm. In comparison with the wrist of humans as an aid for swinging from hand to hand, the gibbon's ball-joint wrist greatly reduces both the amount of energy needed in the upper arm and torso and the stress on the shoulder joint. Brachiation in gibbons is further aided by their long hands and feet, with a deep cleft between the first and second digits of their hands. Although primate taxonomy has undergone many revisions in recent years, gibbons generally comprise the family Hylobatidae of the superfamily Hominoidea (apes) of the order Primates. In recent taxonomies, this is one of two main families of apes, the other being Hominidae, which includes humans, chimpanzees, gorillas, and orangutans. However, there are diverse classification schemes. Today's systematists strive to trace the lineage of taxa through time, more so than group simply by anatomical similarities, and thus classifications are revised as new information on relationships is gathered. The physical similarity of the apes to humans makes them an attractive object of human observation in the wild and in zoos. Four systematic groups of gibbons are recognized. These were traditionally placed at the level of subgenera within the genus Hylobates. 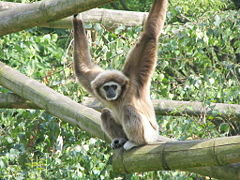 Many current definitions of gibbons include that they belong to this genus. However, in recent years, the four subgenera have been raised to the level of genera, and Geissmann (2006a) reports that "recognition of the four groups as full genera is now widespread." These four genera (formerly subgenera) are recognized based on their diploid chromosome number: Hylobates (44), Hoolock (38), Nomascus (52), and Symphalangus (50) (Mootnick and Groves 2005; Geissmann 2006b). Gibbons are found from northeast India to Indonesia and north to southern China, including the islands of Sumatra, Borneo and Java. Gibbons are masters of their primary mode of locomotion, brachiation, swinging from branch to branch, for airborne distances of up to 15 meters (50 ft), at speeds as much as 56 km/h (35 mph). They can also make leaps of up to 8 meters (27 ft), and walk bipedally with their arms raised for balance. One unique aspect of gibbon physiology contributing significantly to its remarkable brachiation capabilities is the ball and socket joint forming the wrist connecting the hand with the forearm. In comparison with the wrist of humans as an aid for swinging from hand to hand, the gibbon's ball-joint wrist greatly reduces both the amount of energy needed in the upper arm and torso and the stress on the shoulder joint. Brachiation in gibbons is further aided by their long hands and feet, with a deep cleft between the first and second digits of their hands. Their fur is usually black, gray, or brownish, often with white markings on hands, feet, and face. Some species have an enlarged throat sac, which inflates and serves as a resonating chamber when the animals call. This structure is enormous in a few species, equaling the size of the animal's head. Gibbons are social animals and form pair bonds. Strongly territorial, gibbons defend their boundaries with vigorous visual and vocal displays. The vocal element, which can often be heard for distances of up to 1 km, consists of a duet between a mated pair, in which their young sometimes join as well. In most species, males, and in some, females as well, sing solos that attract mates as well as advertise their territory (Clarke et al. 2006). The songs can make them an easy find for poachers who engage in the illegal wildlife trade and in sales of body parts for use in traditional medicine. Most species are threatened or endangered, most importantly from degradation or loss of their forest habitat. 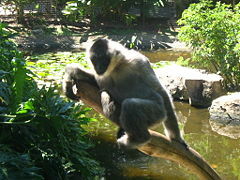 Gibbon species include the siamang, the white-handed or lar gibbon, and the hoolock gibbons. The siamang, which is the largest of the 13 species, is distinguished by having two fingers on each hand stuck together, hence the generic and species names Symphalangus and syndactylus. Gibbon taxonomy has undergone a number of revisions in recent years. Traditionally, they have been placed in the genus Hylobates as can be seen in the taxonomies of Groves (1997), Goodman (1999), Wilson and Reeder (1993), Nowark and Walker (1991), and Napier and Napier (1985). Goodman (1999) further separated the siamangs into their own genus, Symphalangus, but the other taxonomies all included the siamangs in the genus Hylobates. The subgroups traditional recognized were the subgenera Hylobates, Nomascus, Symphalangus, and Bunopithecus (Groves 1997; Nowark and Walker 1991). Geissmann (2006a) noted that it was determined that the molecular distances among these four subgenera are in the same range as seen between humans and chimpanzees, which are in their own genera, and thus the gibbon subgenera should be raised to the genus rank. This has now become widespread. Furthermore, the former extant subgroup Bunopithecus, whose only living member was the hoolock gibbon, was replaced by the genus Hoolock. The Bunopithecus sericus is an extinct gibbon or gibbon-like ape that, until recently, was thought to be closely related to the hoolock gibbons (Mootnick and Groves 2005). For example, in the traditional classification of Groves (1997), the black-crested gibbon was listed as Hylobates concolor. In more recent classifications, it is listed as Nomascus concolor. The following classification is based on that of Groves (2005) and Geissmann (2006b). ↑ Groves, C. P. 2005. Order Primates, Order Monotremata, (and select other orders). In Mammal Species of the World, 3rd ed. Edited by D. E. Wilson and D. M. Reeder. Johns Hopkins University Press, 178–81. ISBN 0801882214. ↑ Mootnick, A., and C. P. Groves. 2005. A new generic name for the hoolock gibbon (Hylobatidae). International Journal of Primatology 26: 971–976. Clarke, E., U. H. Reichard, and K. Zuberbühler. 2006. The syntax and meaning of wild gibbon songs. PLoS ONE 1(1): e73. Retrieved January 18, 2007. Geissmann, T. 2006a. Hoolock gibbons get a new genus name. Gibbon Journal. Retrieved March 12, 2007. Geissmann, T. 2006b. Gibbon systematics and species identification. Gibbons.de. Retrieved April 13, 2006. Goodman, M. 1999. The natural history of the primates. American Journal of Human Genetics 64: 31–39. Groves, C. P. 1997. Taxonomy and phylogeny of primates. In Molecular Biology and Evolution of Blood Group and MHC Antigens in Primates. Edited by A. Blancher, J. Klein, and W. W. Socha. Berlin: Springer-Verlag. ISBN 3540616365. Groves, C. P. 2005. Order Primates, Order Monotremata, (and select other orders). In Mammal Species of the World, 3rd ed. Edited by D. E. Wilson and D. M. Reeder. Johns Hopkins University Press, 178–81. ISBN 0801882214. Mootnick, A., and C. P. Groves. 2005. A new generic name for the hoolock gibbon (Hylobatidae). International Journal of Primatology 26: 971–976. Wilson, D. E., and D. Reeder. 1993. Mammal Species of the World: A Taxonomic and Geographic Reference. Washington: Smithsonian Institution Press. ISBN 1560982179. Gibbon Network and Research Lab. This page was last modified on 21 June 2017, at 19:33.